Ticket to Ride: Europe is a train game settled at the beginning of the 20th century in Europe (of course). It's about building the most rewarding tracks to win the game in the end. Great Components. The gaming material is of high quality - as known by most of the Days of Wonder releases. The box comes with a huge map (covering the whole continent), with cards, little train miniatures (for marking your tracks) and some cubes. The rules are simple and easy to understand, you know about the basic mechanics in about 15 minutes. At the beginning of the game each player chooses the routes he has to complete with his train tracks later on during the game - each route completed successfully earns victory points. Then in each turn one of four different actions can be chosen: A player can either collect new train cards OR build a track between two cities with his train cards OR collect new routes to complete OR build a railway station (which makes connections between certain cities easier). The player with the most victory points wins the game. What I really like is the fast accessibility of the game. You can teach it in 10 minutes and it often doesn't take longer than 45 minutes to complete. It it is a good mixture of luck, risk and the need for planning (light strategy aspect) - especially when three or more players are involved also interaction plays a role. A great choice to play between heavier games or with not so experienced gamers - if you nevertheless are looking for exciting gameplay. 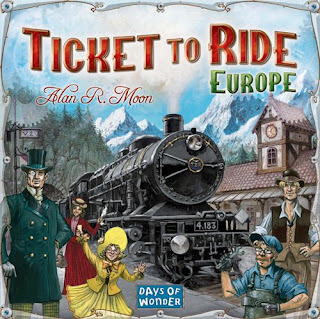 Ticket to Ride: Europe takes you on a new train adventure across Europe. From Edinburgh to Constantinople and from Lisbon to Moscow, you'll visit great cities of turn-of-the-century Europe. More than just a new map, Ticket to Ride: Europe features brand new gameplay elements including Tunnels, Ferries and Train Stations. 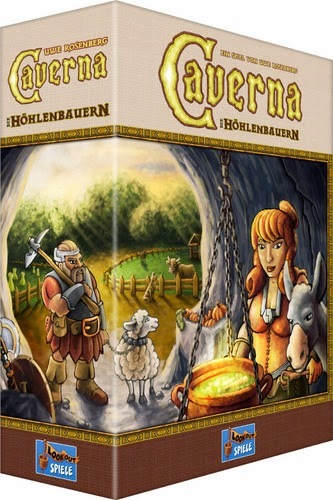 The game also includes larger format cards and Train Station game pieces. 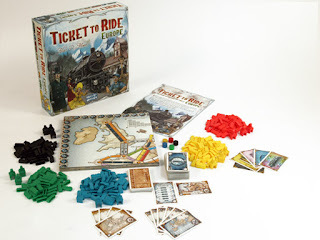 Like the original Ticket to Ride, the game remains elegantly simple, can be learned in 5 minutes, and appeals to both families and experienced gamers. Ticket to Ride: Europe is a complete, new game and does not require the original version.